(2015) "Break Up in a Small Town"
(2015) "Make You Miss Me"
"Break Up in a Small Town" is a song co-written and recorded by American singer Sam Hunt. It was released to country radio, by MCA Nashville on September 21, 2015 as the fourth single from his debut studio album Montevallo (2014). The song was written by Hunt, Zach Crowell and Shane McAnally. The song has country and R&B influence, which Hunt expressed in an article with Billboard. Shane McAnally said of the influence: "It's a model that I think many people could learn from because you are still evolving as an artist along the way. Just because you put music out, it doesn't mean that is where you stop for the next year." Hunt then discussed the process of making the song, saying it was born when he was "singing that chorus melody late one night while riding around trying to come up with song ideas." He originally "didn't want to write anymore break up songs," but the melody of the song changed his mind, saying it "fit too perfectly not to go with it." The song was inspired by his breakup with his then-girlfriend Hannah Lee Fowler whom he has since married. Hunt "sing-talks" during the verses of the song similar to American singer Frank Ocean's method in his song "Thinkin Bout You;" the chorus is then met with elements of dubstep. Billy Dukes of Taste of Country gave the song a favorable review and observed the song as "likely the wordiest song of 2015" and Hunt's "most genre-bending release to country radio", adding "Any talk of which genre Hunt belongs in misses the point. His story hits hard. It's deep and emotional and sincere and all the things we expect from a great country song." The music video was directed by Tim Mattia and premiered in October 2015. The song debuted on the Hot Country Songs chart at number 30 for the week of August 30, 2014, the week his EP X2C was released, with 24,000 copies sold. All four songs from the EP debuted on the chart, with "Ex to See", "House Party", and "Break Up in a Small Town" doing so exclusively through digital sales. It also debuted at number 16 on the Country Digital Songs chart. Following its release as a single from Montevallo, the song peaked at number two on the Hot Country Songs chart, but was kept out of the top spot by "Die a Happy Man" performed by Thomas Rhett. The song became Hunt's fourth consecutive top-three hit on the Hot Country Songs chart. The song was certified Gold by the RIAA on September 3, 2015, and Platinum on December 17, 2015. As of March 2016, the song has sold nearly 1,230,000 downloads. ^ a b Easton, Anthony (19 November 2014). "Sam Hunt: Montevallo". Popmatters. Retrieved December 31, 2014. ^ a b c d e Leight, Elias (August 24, 2014). "Jason Aldean & Sam Hunt Chart New Path With R&B-Influenced Country". Billboard. Retrieved October 13, 2014. ^ McClellan, Laura. "The 6 Realest Songs About Sam Hunt's Wife". Taste of Country. ^ Dukes, Billy. 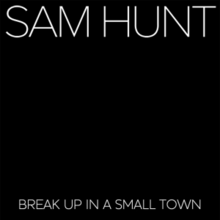 "Sam Hunt, 'Break Up in a Small Town' [Listen] Read More: Sam Hunt, 'Break Up in a Small Town' [Listen]". Retrieved 23 September 2015. ^ "CMT : Videos : Sam Hunt : Break Up In A Small Town". Country Music Television. Retrieved October 20, 2015. ^ Matt Bjorke (August 20, 2014). "The Top 30 Digital Singles – August 20, 2014". Roughstock. ^ a b "American single certifications – Sam Hunt – Break Up in a Small Town". Recording Industry Association of America. If necessary, click Advanced, then click Format, then select Single, then click SEARCH. ^ a b Bjorke, Matt (March 27, 2016). "Top 30 Digital Country Singles Chart: March 29, 2016". Roughstock. ^ "Sam Hunt Chart History (Canadian Hot 100)". Billboard. ^ "Sam Hunt Chart History (Canada Country)". Billboard. ^ "Sam Hunt Chart History (Hot 100)". Billboard. ^ "Sam Hunt Chart History (Country Airplay)". Billboard. ^ "Sam Hunt Chart History (Hot Country Songs)". Billboard. ^ "Billboard Country Update for December 14, 2015" (PDF). Billboard. Prometheus Global Media. December 14, 2015. p. 7. Retrieved December 15, 2015. ^ "Best of 2015: Hot Country Songs". Billboard. Prometheus Global Media. Retrieved December 9, 2015. ^ "Country Airplay - Year-End 2016". Billboard. Prometheus Global Media. Retrieved January 4, 2017. ^ "Hot Country Songs - Year-End 2016". Billboard. Prometheus Global Media. Retrieved January 4, 2017. ^ "Canadian single certifications – Sam Hunt – Break Up in a Small Town". Music Canada. This page was last edited on 1 March 2019, at 13:20 (UTC).